Are we about to 'de-pave' a little bit of Lennox paradise? I'm not a huge fan of Joni Mitchell but there's one song of hers that speaks such a raw truth that it always gives me shivers. Maybe you recognise these lines? 'Don't it always seem to go, that you don't know what you've got till it's gone, they paved paradise and put up a parking lot'... such simple lines, that really reflect on what we as people have done to so many of our naturally beautiful places. Now I ask you, if I may, to imagine this - it's a hot summers day, the nor'easter is howling, maybe you've got some whinging kids and you'd really like to get out of your stir crazy house! You decide it might be nice to head down to Lake Ainsworth (did I mention there's some giant shark hanging around in the ocean still). So you get to the lake, park in the new grass-paved car park, and make your way to your usual spot in crowdy corner (opp surf club). But... to your surprise crowdy corner is not so crowded anymore - and when you look north to where that old dirty road was that sat so close to the lakes edge you see an expanse of green recreational space, people picnicking, kids playing, a nice walking track to push the stroller or old nan on, and the odd nature-lover that doesn't feel guilty about enjoying the lake anymore! You find a perfect spot (out of the wind) to sit and be happy! Before I go any further, I should explain why the nature-lover doesn't feel guilty about enjoying the lake anymore? You see, the nature-lover has known that the health of the lake hasn't been particularly good for a long time. But now, hidden amongst all this new greenspace, is a whole lot of soft engineering, designed to absorb and filter stormwater runoff. This runoff has been polluting the lakes waters with sediment, nutrients, faecal material, heavy metals, oil and grease. Whilst the vision I portray might sound like something I made up while sitting on my verandah - whimsical it’s not. It’s a vision that finds its roots from the numerous scientific studies, management plans and concept designs aimed at better managing Lake Ainsworth, that have been prepared over the past 20 years. And in the hopes to best look after our lovely Lake, it’s the vision that so many folks in our community have been fighting to achieve for almost the same amount of time. So are we about to ‘de-pave’ a little bit of lennox paradise? Maybe? After years of studies, planning and community drive to see Lake Ainsworth better managed, the reality of this vision is looking tantalisingly close. 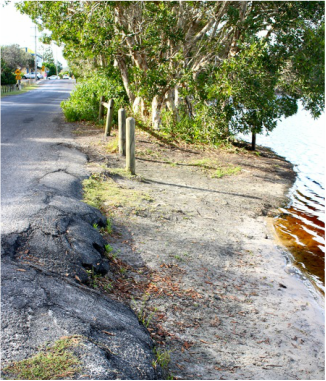 Council have almost finalised their plans to close off the eastern road and carry out the much needed works to 'improve the amenity and health’ of the lake. We’re not cracking open the bottle just yet - but should these works really happen we’ll certainly be embracing them. All going well, they will be changes that as a community we should feel positive about, excited by and proud of.